Before the Click It or Ticket campaign began in Texas in 2002, only 76.1 percent of the state’s population was buckling up. 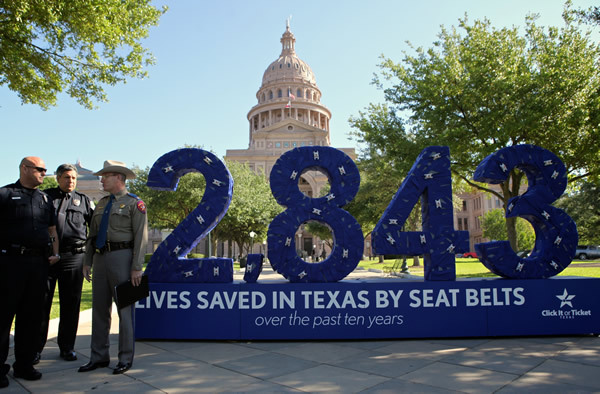 Thanks to a decade of increased enforcement and an extensive public education campaign about the life-saving benefits of seat belts, Texans are using seat belts in record numbers. According to the Texas Transportation Institute, 93.84 percent of drivers and passengers now buckle up. Experts at the National Highway Traffic Safety Administration (NHTSA) estimate that this increase over the past 10 years has resulted in 2,843 fewer traffic fatalities, 48,000 fewer serious injuries, and a savings to the state of more than $10 billion in associated costs.